One thing beauty magistrates in Tinseltown have learned is that the smoky eye is not going anywhere any time soon. If this is a look you have not perfected yet, take some time and go with the trends as this beauty look is determined to stay. Yes, every starlet in Tinseltown knows that smoky eyes are STILL all the rage right now, and you may want to play around to achieve this look. Besides drama, a great benefit to smoky eyes is that they offer a look of depth that most other eye looks can not achieve. The key is in the product here and in color as well. Gone are the days where greys and dark hues created the smoky look. This Spring and Summer designers have gone with purple as the new black for the smoky eye this year which is lovely since this shade works with just about every skin tone. How to do it? Step 1 – Start off with the violet hued eye liner and rim both top lash lines and lower lash lines. Be sure to also rim the outer edge of your lower lashes. A liquid liner is very dramatic and will offer the most precision for this look. Step 2 – You then want to set the liner by applying your lightest shadows first all over your lid to your brow. These particular shades will add to the depth of the eye by offering a glow that is more smoky and neutral and not heavy. 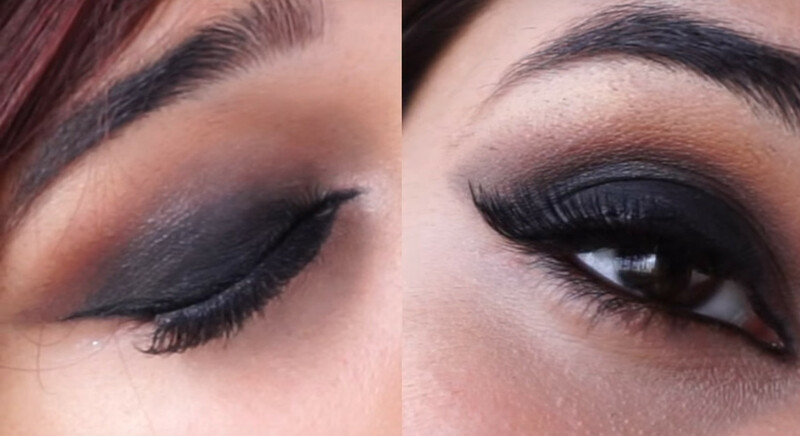 This way you can even pull off the smoky eye for day if you want. Step 3: You will then take your darker shadow and line the crease of your eye. Use a Q tip to smudge the shadow, and you can shade the shadow as high up to your brow as you like. The higher you go the more dramatic your look, play with it and see what works for you. Step 4 – Finish the look by applying volumizing mascara, TWO coats, to both upper and lower lash-lines. You have gone pretty dramatic with the liner, and dramatic liner looks naked without dramatic lashes.